New Year Cheese Party - Raclette de la Nouvelle Année ! ATTENTION, THE NUMBER OF PLACES IS LIMITED .. Thank you to register ONLY if you are SURE to join !! 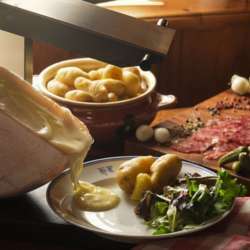 In order to celebrate this New Year and the end of the year, I invite you to meet next Tuesday to enjoy a real french Raclette at French restaurant "El Bocado de Carole"
We will taste this French cheese speciality in a warm atmosphere! I hope to see you there !! ATTENTION, LE NOMBRE DE PLACE EST LIMITÉ.. Merci de vous inscrire SEULEMENT si vous êtes SÛR de venir !! Nous y dégusterons cette spécialité fromagére francaise dans une ambiance chaleureuse !!! J'espére vous y voir ! !